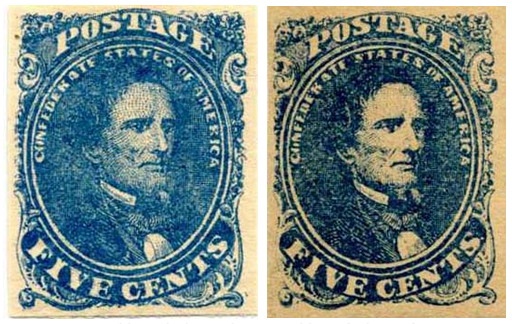 Charles Ludwig's engraving of Jefferson Davis, which forms the stamp's central design, is the same as for the 5-cent green printing (CSA 1). The range of shades of blue among the issued stamps is wide. Based on incomplete records, there were 6,762,000 stamps printed from two different lithographic stones. They were printed on soft, porous, wove paper, and they were imperforate. The most typical use was for the 5-cent rate (under 500 miles), although pairs are known that were used for the 10-cent rate (over 500 miles). The stones can only be absolutely identified by plating, not by color or clarity of printing. Stone 2: The earliest recorded date of use is February 26, 1862. A detailed plating appeared in The Confederate Philatelist in an intermittent series of articles in Volume 11, No. 8 through Volume 13, No. 2, November 1966 – April 1968. The plating is identical to the 5-cent green design, CSA 1-2. The stamps were printed in sheets of two hundred, panes of one hundred, and a transfer stone of fifty without imprint. The impressions are generally rough and coarse, and the colors range from light to dark blue. The same consistent printing varieties as for the 5-cent green. Stone 3: The earliest recorded date of use is April 10, 1862. Plating has been completed. The stamps were printed in sheets of two hundred, panes of one hundred, and a transfer stone of fifty without imprint. Impressions are generally clear and sharp. The two most common shades are a clear deep blue and a light milky blue. This stone was never used to print the 5-cent green. Major print varieties are known, although not as pronounced as on Stone 2.